When you’re in the kitchen, cooking away, adding some lemon zest to a fresh, vegetable salad, you’re always left with half a lemon, only to be placed in the fridge, waiting for tomorrow’s meal. 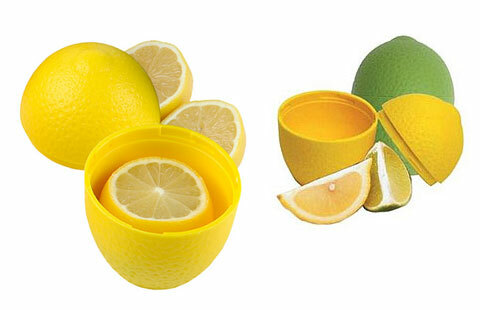 The Lemon / Lime Saver is a specially designed storage container for just that. The Lemon / Lime Saver is a dishwasher safe, plastic container which keeps cut lemons and limes fresh and fragrant; it’s also a fun way for serving cut lemons and limes at the table. Made of bright and colorful plastic (yellow or green for you to choose from), the 2 sides attach by an airtight twist lock prolonging the life of your cut citrus. This fun storage container is also available for cut tomatoes and/or onions. So if you’re cooking a juicy hamburger for example, keep on to those extra onion rings and sliced tomatoes – no onion odor left in the fridge, no stains or spills.